2012 LML totally stock, besides H&S mini-max and Fass 150. When pulling any sort of load up a grade even in 30 degree weather, the truck overheats (coolant and trans temp) and the fan clutch never engages on high. I can never hear it engage and when I pull over to try and cool it down, the fan is very obviously spinning slowly, not engaged. No CEL, but scanning for codes pulls up P0483 "cooling fan rationality check malfunction". I figured it was a bad fan clutch, so I replaced it from a dealer purchased, brand new clutch... No change. 2 separate new relays... Also, no change. I haven't been able to find any information or schematics/wiring diagrams that are readable to troubleshoot the electro-viscous fan. Turning the A/C on or whether the truck is hot or not doesn't force the fan to come on. Cooling stack is clean and coolant is pretty fresh. Any help is greatly appreciated and so would any wiring diagrams for the circuit be really helpful? Also, would a tech from a dealer likely be willing to plug in a techII and force my fan on to see if it works without charging me labor? (Takes 2 Minutes). 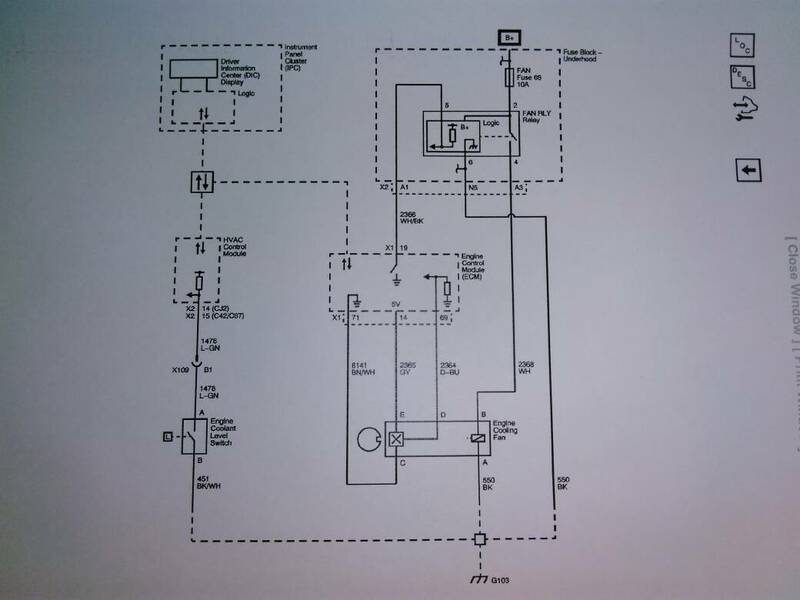 I went and got a copy of the schematic/wiring diagram from the dealer and took a picture with my phone.... When I figure out how to post it, I will. The fan appears to be controlled by pulse width modulation from the ECM. Maybe the issue is internal to the ECM? 2012 GMC Sierra Denali 2500HD LML, stock, H&S mini-maxx (which I don't care too much for), and Fass 150. (SOLD) 2004.5 Chev 2500HD LLY, go-fast parts, and burning CNG. Im sure you checked the ground to the fan and the 10 amp fuse but did you run a jumper across the plug on the coolant switch when eng up to temp ? I have heard of those switches doing strange things and maybe with your tuner it suppressed codes ! Have you tried a Tech 2 yet ? start tracing wires, bet you got some that are broke. wouldnt hurt to check fuses and the relay as well. a power probe would make diag this pretty easy. When the Tech 2 is plugged in, this is what it comes up with when you try and communicate or command the cooling fan on. Any thoughts? 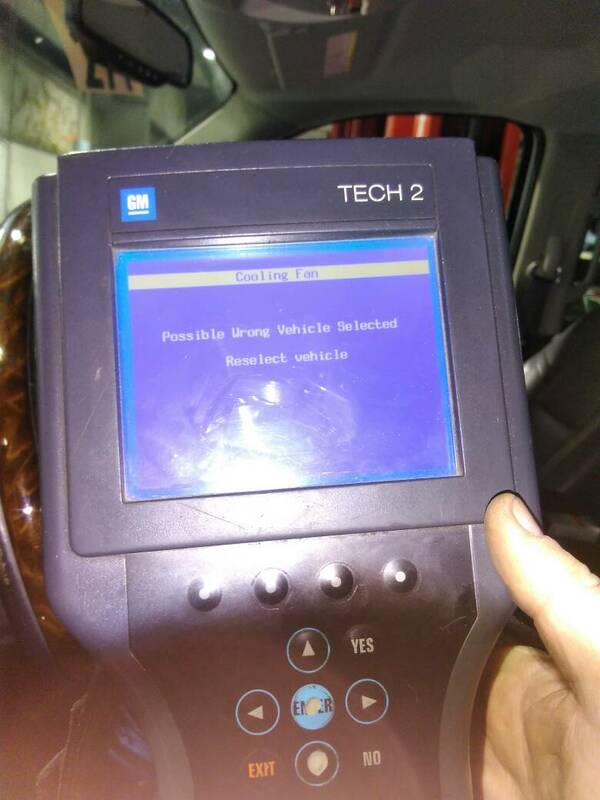 Maybe that GM tech is setting up the tech 2 is a moron? I guess I better start tracing wires. Have you tried replacing the coolant switch, not sure if its just a coolant level switch or level and temp switch? I haven't tried replacing the Coolant Level sensor, although I did jump across it with a wire and there was no change. Even as the truck was running, when I unplugged, put back in the jumper, then plugged it back, no indication on the DIC. Is that weird? Should it have told me coolant-low or something? Also, I haven't had the chance to try the Tech II again using 2011 as the year. I may go out and buy a Snap-On Solus edge tonight, if it will pretty much work as well as the Tech II. Hey did you ever figure this out? Mine is doing the same thing!! !